Almost exactly two years ago today, I finished the first draft of Red Soil Through Our Fingers. As I talk to friends and family about my novel, I’ve encountered a recurring set of misconceptions around the finances of self-publishing a novel, especially an ebook. I admit I knew nothing about how book publishing worked before embarking on this adventure and having to learn about e-publishing the long way, so I am hardly surprised that few people seem to be aware of the costs. I’ve also run into a few aspiring writers who seem to think self-publishing an ebook means they simply get to make their total sales number times their chosen list price. Spoiler: That’s really, really far from the truth. So here’s me being transparent about my journey as a new and (hopefully?) rising science fiction author. Some background: Prior to publishing Red Soil Through Our Fingers in January 15, 2016, I had published two short stories in professional paid markets. Red Soil was my first novel of any kind, and my first self-publication. The novel is ebook only — there is no print version — and I sell it through two major networks: Amazon Kindle Direct Publishing, and the Smashwords network (which includes most every other ebook retailer you’ve ever heard of besides Amazon, such as Barnes and Noble, Apple, Kobo, etc). 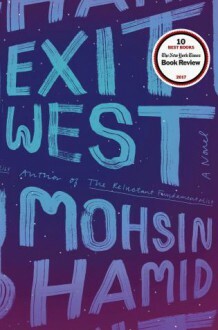 The novel was priced at $0.99 as a pre-order through December and the first half of January, then released on January 15th at a list price of $2.99. Also, it should go without saying that self-publishing involves a staggering number of diverse factors. I don’t claim that my experience is universal in any sense, nor that I’ve made the most optimal decisions. I’m on a learning curve myself, and I only hope that revealing some of the backstage data can provide some useful insight. The great news is that 72 people have actually purchased my book to date. Thank you! I appreciate that you took a chance on a new author. If you bought Red Soil Through Our Fingers in the last few months, you are among the first readers ever to support my writing. Whatever that ends up being worth to you, I’m grateful you were able to share in my creative product. 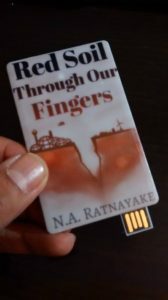 In addition, I gave away 155 custom USB drives to beta readers and to fans at the two major science fiction conventions here in New England, Arisia and Boskone. I wanted to be able to hand out the book itself, something more concrete than a business card (which still requires the recipient to go out and buy the book). I also included a interview, a video introduction to the issues, and copies of my two published short stories to make it a commemorative “special edition” token. (People loved the concept, by the way). So that’s a total of 227 copies of Red Soil Through Our Fingers knowingly distributed over six months. Not bad at all! In terms of revenue, you might think my book income so far might be 72 sales x $2.99 list price = $215.28. However…34 of the 39 sales through the Smashwords network were free or discounted by 50% through a promo code. Of the 33 Amazon sales, 16 were pre-ordered at the promotional price of $0.99, the rest were purchased at list price. And let’s not forget fees. Sales directly through Smashwords return 85% of the list price, which is awesome. But most of my sales through the Smashwords platform have actually been through other retailers like the Apple and Barnes & Noble. In these cases, Smashwords takes a much smaller cut, but the retailer also takes their own cut, as much as 35%. Amazon takes 30%, unless I choose to opt-in to KDP Select, which has huge moral and practical costs which I decline to accept. In the aggregate, about 38% of gross revenue was taken as fees for my sales through the Smashwords network as a whole, and about 39% for Amazon. That leaves $40.27 from Amazon, and $21.44 from all other retailers combined, for a total net sales income of $61.71. Accounting for all the free copies I gave away, that’s an average income of twenty-five cents per knowingly distributed copy. Again, I’m very happy that so many people are getting copies of my book… that’s more than most aspiring writers ever get to see. But if you’re one of those aspiring writers thinking that self-publishing is a quick way to make a few bucks… well. It took two and a half years to write and publish the novel. You do the math if you want to know the hourly rate. So what did it cost me to get here? Self-publishing an ebook seems like it would be free to the uninitiated, but the costs can be much higher than one might think (and certainly higher than I expected). First of all, your book needs an editor. I’m grateful to my network of fellow writers and readers who helped me collaboratively edit successive drafts of my first novel. Otherwise, that service could have cost me several hundred to over a thousand dollars for a novel-length manuscript. I was spared this time… I may not be able to get away with that in the future. Secondly, a good book needs a good cover. The Smashwords Guides have remarkable data on the difference that a good cover makes in selling a book. But even without looking at the data, you already know… we all judge books by their covers all the time. In fact, when competing for reader eyeballs on a giant Amazon listing of potential books that is literally millions of titles long, a good cover is actually the only hook you have. I paid my cover artist $200 for an original design, a price I believe was fair and well-worth the amazing final result. Along with the other miscellany I’ve bothered to keep track of, the total cost of publishing and marketing my first ebook novel so far is over $1000. The basic investment of marketing by giving away free copies is the hope that a) readers will be satisfied with the product they received for free, and b) they will then pass on their satisfaction by word of mouth and online reviews, thus eventually yielding many more sales than the initial cost. So far, it seems that outcome (a) has been met. (Thankfully… seeing as that’s actually more important to me… see Concluding Thoughts below.) 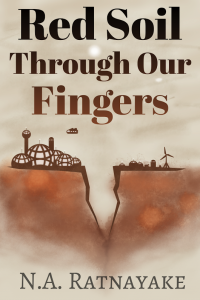 Red Soil Through Our Fingers has an average 4.3 /5.0 rating on Amazon, an average 4.0/5.0 rating on GoodReads, and a straight up five stars in the Apple iBook Store. Thank you! I truly appreciate those of you who took the time to write thoughtful reviews, including those with less-than-stellar ratings. Honest reviews help readers decide to take a chance on an unknown author like myself, convey an authentic reaction to the story, and help spread the word about the book. However… I should note that these ratings come from a total of only fourteen reviews. That means that, despite an average rating that is very positive, only 6% of distributed copies so far have actually resulted in a review. Whatever the case, the numbers are what they are. It would be nice to see more reviews of the book, but that said, I’m very happy that what reviews I have received are overwhelmingly positive. From a purely financial perspective, to-date I’m still in the hole $964.61 on self publishing my first novel. Now, let me state here that I’m not actually trying to make money on my writing. I have a day-job that pays the bills and no intention of either A) trying to write full-time at any point in the near future, or B) giving up writing because it doesn’t make any money. I write as a hobby… because I love making up stories, exploring the intersection of ideas and people, and sharing those discussions with other people, hopefully toward the end goal of making the world a better place. Obviously, I plan to keep talking about Red Soil and seeing where it goes, even while I work on the next novel (as yet untitled, but look for details on the blog and on Facebook as the ideas take shape!). It was a great personal accomplishment for me, a huge confidence boost to my writing, and of course a serious learning experience. At the end of the day, I’m very glad I did it, and I’m very grateful to all those who helped me reach this milestone.